I've had an unusual number of visitors from the states this year. The good thing about it, besides catching up with friends, is that I've had a chance to revisit a bunch of night markets to compare and update my impressions. I get to take them around, point out the good eats and watch their faces as they happen upon the smell of stinkalicious stinky tofu. 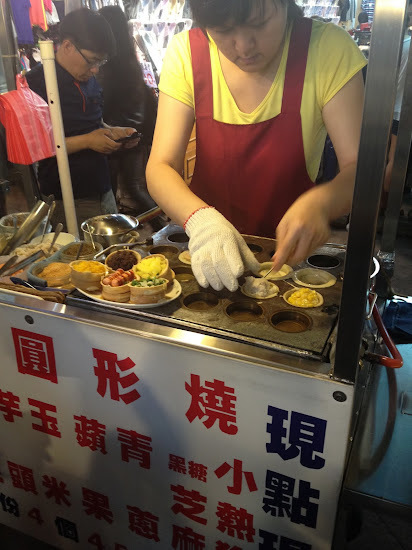 While Tonghua Night Market may not be as famous or big as Shilin night market or have as fancy a sign as Raohe (which I think has gone downhill since I reviewed it last), I think it might be my new favorite. 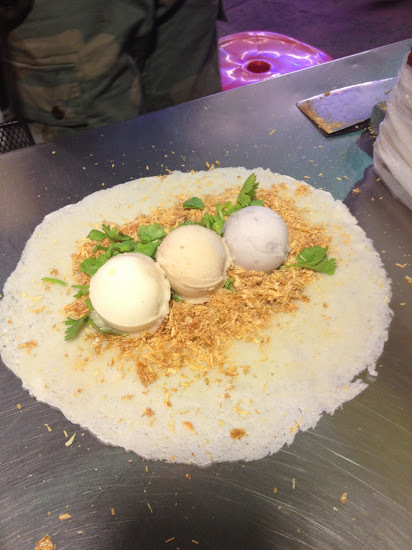 It's got great renditions of my favorite night market snacks- ice cream run bing wrap, Taiwanese sausage in sticky rice da chang bao xiao chang, and stinky tofu. Also not to be missed (though I didn't get a photo) are the candied yams that are bite sized pieces of yams with a crunchy, sugary coating and shaved ice. 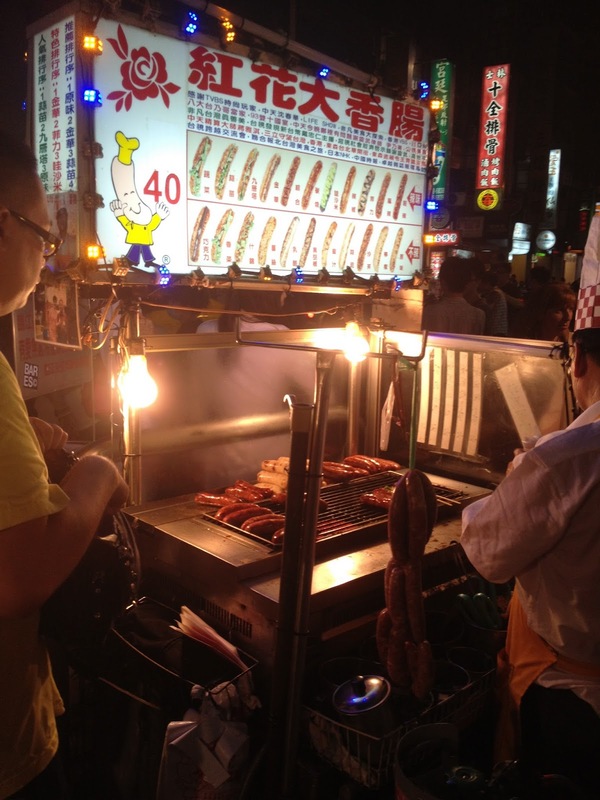 If you haven't eaten dinner, you can also grab a seat at the cheap teppanyaki shops that Tonghua is known for. 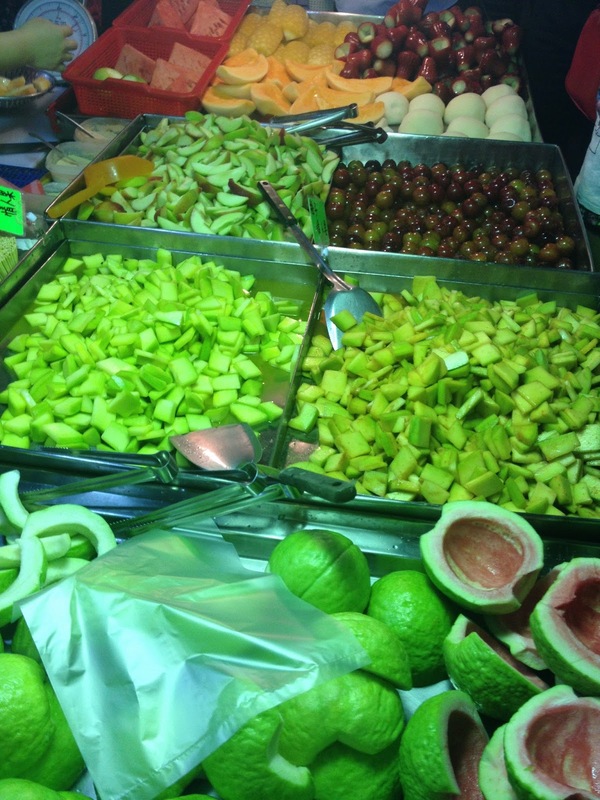 While most of my friends call it Tonghua night market, it's actually on Linjiang Street, so some people also refer it as Linjiang Night Market. The main night market area is marked by two entrance signs, so be sure to note which cross street (Keelung or Tong Hua) if you are meeting up with friends. The ice cream at this vendor was sorbet-like with pineapple, red bean and taro flavors and was not too sweet or watered down (I had a bad one at Sanxia last month) and the wrapper was paper thin. I recommend you try it with the cilantro, it really works with the flavor and texture of the peanut shavings. FAVORITE! This was one of the first times I've seen so many savory options for the red bean cake. Not necessarily enticing to me, but unique. This is what I'm talking about. 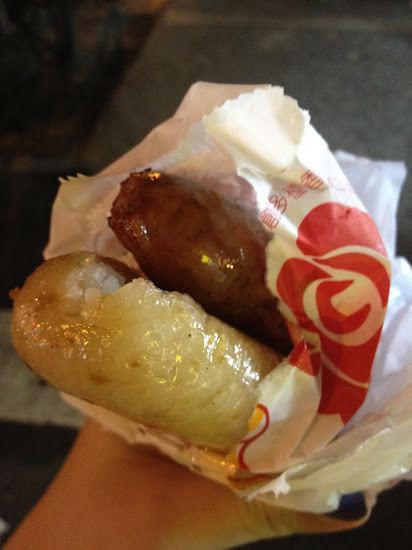 Sweet grilled Taiwanese sausages shoved into a grilled sticky rice sausage, cut in half to be the bun. In Chinese, this Taiwanese "hot dog" is called Da Chang Bao Xiao Chang or Big Sausage wrapping the Little Sausage. Love it. LOVE IT! Not the most healthiest snack, but hey, I only night market it once in awhile. You can get it with different toppings and sauces, but I prefer the original flavor with some pickled vegetables- not too much other craziness. 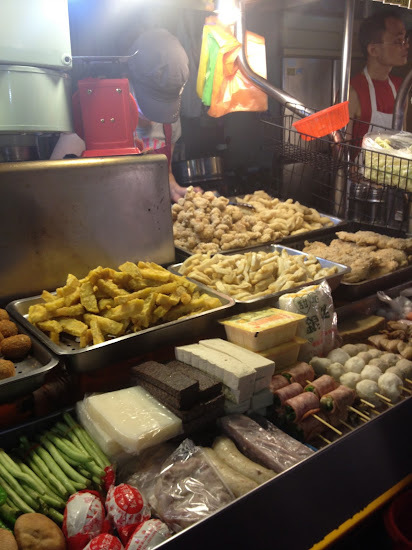 So if you're visiting Taipei this summer and making the night market rounds, be sure to include Tonghua on your list (I gotta go back and explore it some more too). Especially if you're staying near 101, as this is the closest night market to it. Yea, I call it Tonghua even though I know it's wrong. Tonghua night market also has really good Vietnamese sandwiches and also fried shrimp balls, which are as close to fried shrimp balls with walnuts, that I used to love in San Francisco, as I can find here. If they only added walnuts. 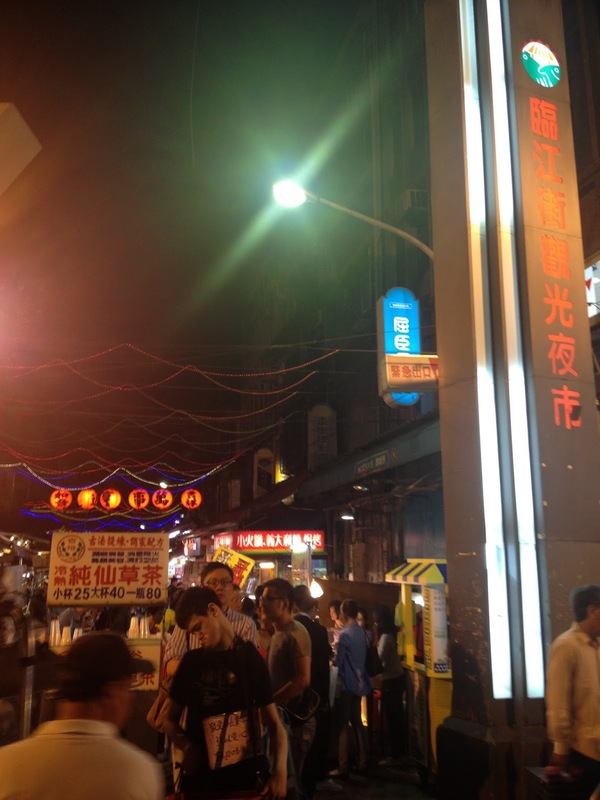 Raohe is my closest night market, and I'm dismayed by how many Chinese tourists are bussed there now. 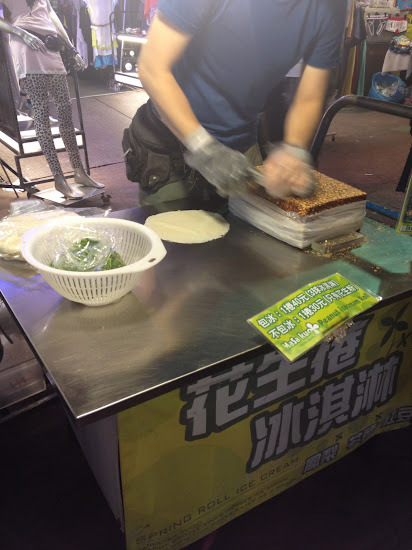 They do have a stall that advertizes "Shenkeng" stinky tofu, which is OK but it's not quite really Shenkeng stinky tofu. Shenkeng stinky tofu is so good, I wonder how hard is it to get someone from Shenkeng to come over the hill and bring some of the real thing. It's not like burritos, pizza or bagels, Shenkeng is right there. And still it's only on bike rides that go through Shenkeng that I can get the stuff. I think my favorite night market is still Raohe. It's not as crowded as Shilin but I feel like the food is more delicious! Oh man, how I miss the ice cream/peanut shavings wrap! 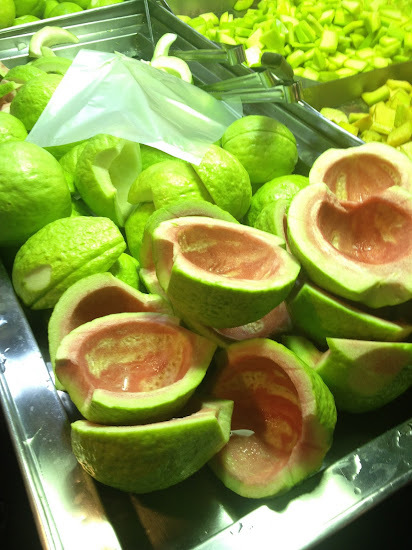 My first time ever having one was while vacationing in Hualian several years back, and when I lived/studied in Taipei a few years ago, I couldn't find it anywhere (there used to be one on Yong Kang, but it closed shortly after I found it). Anyway, plan on hitting this little vendor up when I visit Taipei again in a few months' time, and hopefully they're still there! How far is it from Taipei 101? Can we walk there? Thanks.